Wolfgang Uber Rinseless Wash 128 oz. Free Bonus! Home > Wolfgang Product Line > Wolfgang Uber Rinseless Wash > Wolfgang Uber Rinseless Wash 128 oz. Free Bonus! For a limited time, Receive a FREE 12 oz. 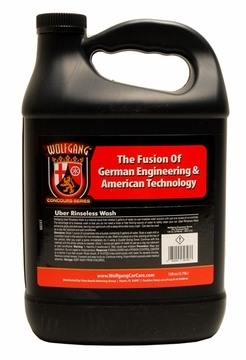 refillable bottle with your purchase of the gallon size of Wolfgang Uber Rinseless Wash! Now there is no need purchase a separate bottle, just to use your favorite Wolfgang Product! 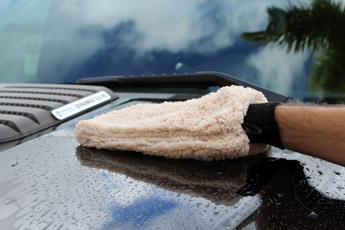 Wash your vehicle anywhere, anytime! Wolfgang Uber Rinseless Wash is a highly concentrated, viscous liquid that creates 3 gallons of rinse-free wash solution with just one ounce of concentrate. Rinse-free wash? That’s correct! Wolfgang Uber Rinseless Wash with its advanced formula enables you to wash your entire vehicle without rinsing it off. This time-saving solution cuts your water usage by 90% while making it possible to wash your car virtually anywhere, including apartment complexes, car shows, and anywhere else that a hose is not available. 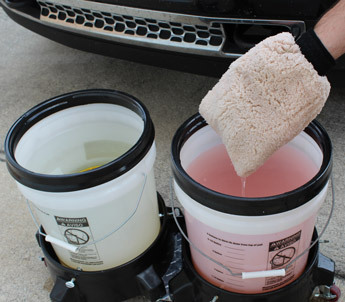 Add 1 ounce of Uber Rinseless Wash to a bucket containing 3 gallons of water to make a rinseless wash. Soak a microfiber mitt or soft towel in the solution. 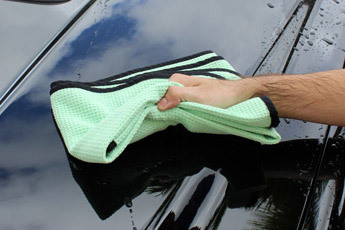 Wash your vehicle one panel at a time, drying off each panel with a Guzzler Waffle Weave Drying Towel before proceeding to the next panel. The super slick German polymers in Wolfgang Uber Rinseless Wash encapsulate dirt particles, protecting your vehicle’s delicate clear coat paint from scratching as the wash mitt glides across the panel. When you agitate the wash mitt against the Grit Guard Insert in the bottom of your bucket, the dirt particles are released and then trapped by the Grit Guard. Ingenious! Add 1/3 ounce to an empty 16 ounce bottle and fill it up with water to create a waterless wash. This application works especially well to pre-treat each panel before washing it using the rinseless wash method. Add ½ ounce to wash water made with your favorite car wash soap. Uber Rinseless Wash contains water softeners that improve the quality of the water, helping eliminate water spots. Super slippery German polymers increase the lubricity of your wash solution, reducing friction to prevent swirl marks and spider web scratches. Add 1 ounce of Uber Rinseless Wash to a gallon of filtered or tap water to create a super slick clay bar lubricant that costs a fraction of what a dedicated clay bar lubricant does. Add 3 ounces of Uber Rinseless Wash to a gallon of filtered or tap water to create a gloss-intensive detail spray. Fill up an empty spray bottle and use it to enhance your vehicle’s finish in between washes, or to remove finger prints and smudges at a car show. The same super slippery German polymers that work to prevent scratches as you wash the vehicle offer the same benefit in this detail spray application. You will love the glossy, slick finish it leaves! Wolfgang Uber Rinsless Wash is arguably the most versatile detailing product ever made! One product serves as a rinseless wash, waterless wash, water softener, clay lubricant, and detail spray! Wolfgang Uber Rinseless Wash is a smart choice to clean your car because it’s environmentally friendly. Uber Rinseless Wash eliminates the run-off that occurs with a conventional wash that requires a hose and a soapy wash solution. When soapy water runs off of your vehicle, it enters storm drains, completely bypassing water treatment facilities and heading straight out into the nearest body of water. All of the oils, soaps, and other cleansers you just rinsed off of your vehicle are now in the nearest river, lake, or stream. That’s an eye opener, isn’t it? The solution is to wash your vehicle using Wolfgang Uber Rinsless Wash, because there is no run off! Everything that was on your vehicle ends up in a towel and not in a local waterway. Uber Rinseless Wash is a 100% biodegradable, water-soluble formula that meets all water usage laws established by the federal Clean Water Act and the EPA (Environmental Protection Agency). Wolfgang Uber Rinseless Wash makes it possible to wash your vehicle in the winter. 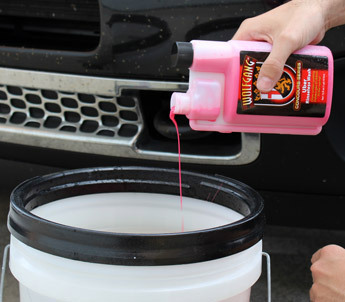 Because Uber Rinseless Wash only requires a bucket filled with 3 gallons of water with no need to rinse, you can quickly and easily wash your vehicle in the comfort of your garage. Rejoice – it’s possible to clean your car even in subzero temperatures! Wolfgang Uber Rinseless Wash helps conserve water. People living in communities with water restrictions are familiar with the frustration of not being able to wash a car in your own driveway. Believe it or not, it’s actually illegal to wash your vehicle using the conventional method in some parts of the world. Uber Rinseless Wash is a solution to the frustrating issue of water conservation because it only requires 3 gallons of water and there’s no need to rinse. 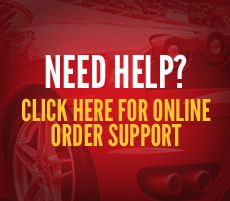 Rest assured you can still enjoy a clean vehicle at home and abide by local ordinances. Wolfgang Uber Rinseless Wash is actually four products in one. This saves you time and money, plus it eliminates waste. If you buy a separate quick detailer, car shampoo, and clay lubricant, you’ll have 3 bottles to throw away. If you replace all those products with one bottle of Uber Rinseless Wash, you’ve only got one bottle to toss. What’s more, all Wolfgang’s bottles are recyclable. Wolfgang Uber Rinseless Wash is one of the smartest purchases in car care. Not only can you wash your vehicle in a third of the time it used to take, you’re helping the environment by saving water. Wolfgang Uber Rinseless Wash In-A-Bucket Kit | Wolfgang Uber Rinseless Wash 128 oz. Free Bonus!